Holiday Gift Styles: Casper’s Beauty Sleep Challenge & Stylish Deals for Better Sleep! November is nearly over, but it’s not too late to take better steps towards National Sleep Comfort Month… Did you know? I didn’t! Casper, a company that makes latex memory foam mattresses, is holding a Beauty Sleep Challenge & Style Darling is up for the task, sharing favorite ways to relax in style & get ready for bed for a more satisfying night’s sleep. Not to mention the fact that everyone’s life gets crazy, so giving the gift of better sleep to a loved one this holiday season is a great idea, whether it’s with a pajama set, fuzzy slippers, stylish throw blanket, or relaxing extras like candles or moisturizers! When it comes to sleepwear, I’m all about color. Here’s the one instance where color-coordination isn’t such a big deal for me. I love mixing pops of color since sleep is all about a time for your body to rejuvenate & why not have fun with colors & patterns that you can alternate for a playful sleep ensemble? When hitting the sheets, I’ve picked some must-haves that will certainly make lounge-time even better, & these selections won’t break the bank! SHOP: Eartherapeutics sleep mask ($8.00) @Ulta. short robe ($39.50) in pink @Victoria’s Secret, pajama set ($13.19) in oatmeal heather @Target, pajama set ($13.19) in grey @Target, & slippers ($17.95) in blue @H&M. This is definitely the time of year to bundle up & I’m not one to shy away from blanket variety, if I’m snuggling up for a Sunday afternoon nap or curling up with my beau for a restful winter night’s sleep. Here’s another opportunity to let your style speak through your sleep-ready essentials. Soft textures & modern prints are what bring any bedding arrangement to life & these will certainly inspire you to get that much-needed shut eye. 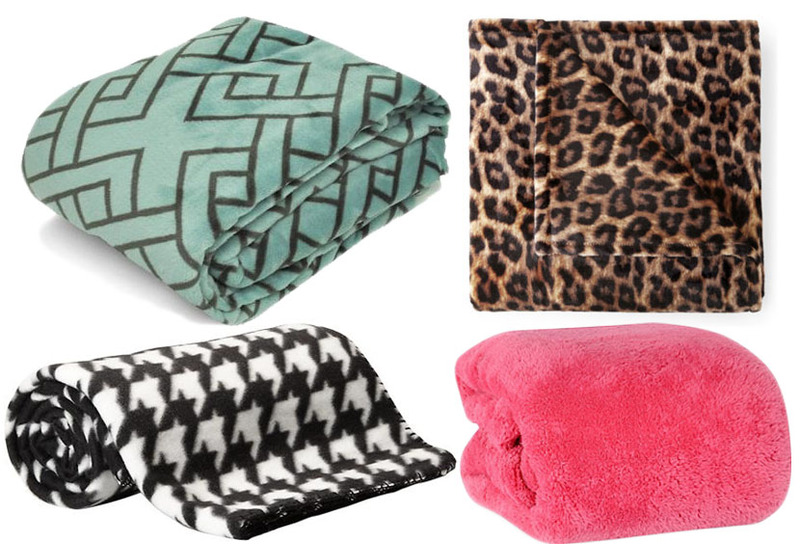 SHOP: throw blanket ($8.88) in interlocking squares @Walmart, velvet plush throw ($8.99) in leopard @JC Penney, fleece blanket ($6.00) in houndstooth @OldNavy, & fluffy throw ($9.99) in fucshia @Bed Bath & Beyond. Before heading off to bed, I always have to take care of my skin since I suffer from dryness. Staying moisturized will keep your skin glowing & healthy for when you wake up! 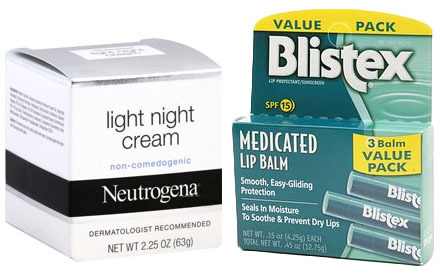 SHOP: Neutrogena night cream ($11.99) @CVS & Blistex medicated lip balm ($3.69) @Drugstore.com for a 3-pack. Lastly, the writer in me loves a good book before dozing off at night. When prepping my mind for dreamland, I have a few other valuable pre-sleep rituals to relax & distress me from everything going on during my hectic day of work, school, relationships, & writing. I try to keep hydrated, especially since this the dryness in the air this time of year sometimes affects my mouth and throat. 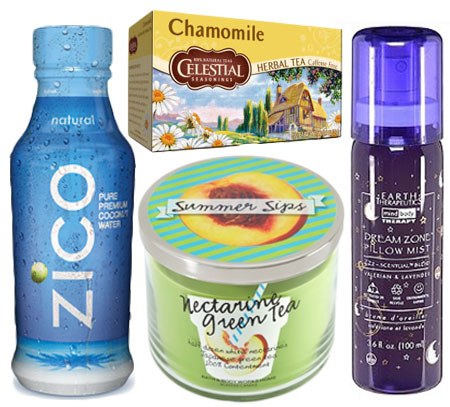 SHOP: chamomile tea ($3.39) @Celestial Seasonings, coconut water ($21.16) @Zico for a 12-pack, candle ($11.25) in necatrine green tea @Bath & Body Works, & Eartherapeutcis pillow mist ($9.00) @Ulta. When it comes to sleep, the best thing you can really do is invest in a quality mattress & pillows that meet your sleeping needs. For more from Casper, be sure to check out their informative & helpful blog, Pillow Talk, featuring plenty of tips for better sleep habits & ways to relax before heading to bed! Where do you like to shop for pajamas? What’s your sleepwear style for the seasons? For more stylish & affordable posts, check out recent #BlackFriday deals from stores like Gap & New York & Company, Jennifer Aniston’s latest red carpet looks, the ultimate photo gallery featuring Olivia Palermo’s style, & winter pastel wardrobe inspiration from Lupita Nyong’o & Elle Fanning! Happy Styling! This entry was posted in #BlackFriday Sale Update, Accessories Access, Basics for a Bargain, Beauty Buys, Holiday Gift Styles, Quickie Darling Deal & Steal, Style Darling Daily and tagged #BlackFriday, Accessories Access, Basics for a Bargain, Bath & Body Works, beauty buys, Beauty Sleep Challenge, Bed Bath & Beyond, better sleep habits, Black Friday Sale Update, Blistex, Casper, Celestial Seasonings, chamomile tea, coconut water, destress candles, Eartherpeutics, fashion, green tea candles, H&M, Holiday Gift Styles, holiday style, houndstooth blanket, JC Penney, lip balm, National Sleep Comfort Month, Neutrogena, night cream, Old Navy, pajama sets, pillow mist, Quickie Darling Deal & Steal, relaxing candles, sleep style, sleeping tips, slipper boots, style, Style Darling Daily, style for days, Target, throw blanket, Ulta, Victoria's Secret, WalMart, Zico. Bookmark the permalink. ← #BlackFriday Sale Update: GOjane’s Major Deals on Shoes, Belts, Jewelry, & More!